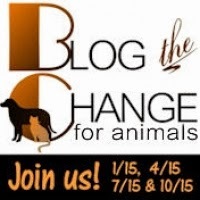 Four times per year, bloggers get together to talk about change and how we can affect it. Today we want to take a minute and talk about volunteers. There isn't a non-profit organization out there that would be capable of keeping its doors open with volunteers. And you can do all sorts of things....think about your skills and how you can help. Are you tech savvy? What about accounting skills? Carpentry? Public speaking? The group mom fosters for has a small adoption center and a resale shop next to it. We need all sorts of volunteers. In fact, there was a volunteer who had leukemia that would stuff envelopes for us (she passed away last year). She wanted to help and knew she couldn't come into do anything in the center, but what a huge help this way. Most people look at an animal rescue and think: cleaning cages and walking dogs. Sure.... most places absolutely need that. But when our adoption site needed some work done, a crew came in and gave their time - to pull up old flooring, lay new flooring and build several sets of heavy duty shelves. And we always are looking for people willing to sit at adoption events and talk to the public. how wonderful to use your sewing skills like that! Techie humans are always needed by rescues to handle things like social media, the website, and email newsletters - usually these things can be done even if you don't live that near to the rescue. Something to think about, especially for those of us who live in big cities, where traffic makes traveling difficult. You are SO right! Volunteers have SO many skills that are incredibly valuable for non-profit rescues. At our shelter, volunteers clean cages, socialize animals, marketing, being spokespeople, collecting cans and donations, and much more. Volunteering is absolutely vital to shelters. Great reminder! I can personally attest to the rewards of those kitty kisses, too! No matter what you do, even if it's stuffing envelopes like the woman you mention, you get to feel really great about doing something positive for the animals. And the rescue organization can do more and better for those animals thanks to you. Love your suggestion! Let's all get out and volunteer in some way! Such a great reminder - there are so many jobs that need to be done, and they aren't always the obvious ones. Everyone has something that they could offer, and every little bit can make a huge difference. Thanks for reminding everyone that there are a variety of ways people can volunteer their skills and time for shelters.